Why change, from Arduino to STM32 ? The answer to the above question is simple, for the computing power and the compatibility with the Arduino connectors. 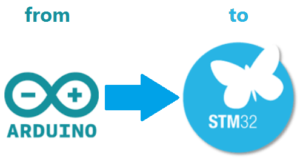 I definitely do not want to convince anyone that it is time to move to a more modern and performing MCU family (Cortex Mx) but, if you found yourself in situations where you wanted to do more, then the STM32 family with its NUCLEO boards and mBed are the answer you have your wishes. For reading more, click here. This entry was posted in STM32. Bookmark the permalink.